How Often Does the Government Shutdown? The third quarter certainly had its fair share of stress for investors. As the quarter came to a close, it was clear the federal government would undergo a partial shutdown on October 1. As if that was not enough, the debt ceiling deadline loomed. There was concern the federal government might default on Treasury bond principal and interest payments or other financial commitments if Congress and the White House failed to act before October 17. Both of these issues ultimately ended up being resolved. Stressful periods like these inevitably lead some investors to wonder whether staying the course is the right approach, but abandoning a well-thought-out plan during such periods is likely to be far more damaging over the long term than most any crisis could be. These three reasons help explain why. First, the world continually faces any number of events that could be deemed crisis worthy. Reacting to each and every one would incur significant costs and likely lead to subpar results. There will almost certainly never be a period when an investor can look around and determine everything is “safe” and now is the time to invest. To make this point, simply think back on major news events over the past handful of years. The world has experienced an economic malaise that continues on, a European debt crisis, significant turmoil in the Middle East and a 2011 downgrade of the U.S. credit rating. Second, research has shown that the vast majority of investors who attempt to time markets have failed. One of the simplest explanations for this: In addition to overcoming the costs associated with trying to time market, investors must be right twice. They must correctly time both the exit from the market and the re-entry. The past few years again illustrate how difficult this is to do. Many investors bailed out of the stock market well into the 2008–2009 decline — that is, they incorrectly timed the exit, only to avoid the market completely from there forward or miss a substantial amount of the rebound that occurred later in 2009 and into 2010. These types of actions no doubt did long-term damage to many investment plans. 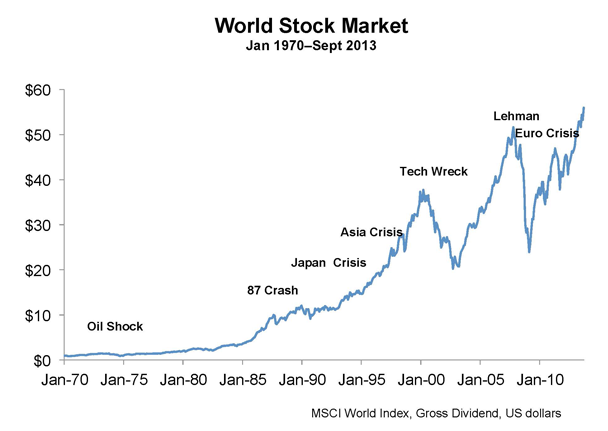 Third, through all the world’s crises, stock and bond markets have generally rewarded a disciplined and diversified investment approach. For example, long-term stock market data (for the period 1900–2012) shows that stock markets have outperformed inflation by about 5 percent per year. These returns occurred in the face of a Great Depression, two catastrophic world wars and countless other geopolitical crises. This result illustrates the fact that market prices usually reflect the risks of investing and tend to reward investors for those risks. One might think that government shutdowns are a rare occurrence but they have actually happened several times. Since 1976, when the modern congressional budgeting process began, there have been 18 government shutdowns. In the 1970s, there were six cases. The 1980s saw eight different shutdowns while there were only three cases in the 1990s. Since 1996, there had not been any cases until the most recent shutdown. In most instances, the shutdowns lasted only a few days with exceptions being the December 1995 shutdown that lasted 21 days, ending in January 1996, and the recent shutdown that lasted 16 days. Investors have grown weary with the periodic debt showdowns in Washington, each one miraculously resolved at the 11th hour. Some are asking whether they should wait in a safe harbor until “certainty” returns. In the fourth such showdown between the White House and Congress over public funding in less than three years, the US federal government was shut down for 16 days in October and hundreds of thousands of federal workers were furloughed. Congress finally came to a deal just one day before the US borrowing authority was due to lapse. The agreement prevented a potential default on US debt. But it provided only another temporary fix, funding the government until January 15, 2014, and raising the debt ceiling only until February 7. Most people around the world are rightly worried about what the political controversy means for their long-term investments and ability to fund their own retirements. The answer is that uncertainty is part and parcel of investing. You can never eliminate it simply because no one can ever be sure about the future. Tying your investments to an opinion about the outcome of the US fiscal situation or the euro zone or any other flash point in the news is a recipe for madness. One advisor in recent weeks had to fend off a client asking whether it made sense to switch a significant proportion of his retirement fund to cash until the situation in Washington “settled down.” The downside was slightly lower returns, but this was protection against a potential catastrophe. The advisor responded by saying that maybe this was a good idea, but would one month be enough? Perhaps the client could wait a year or so. That might be sufficient time for the situation to be resolved. But what if it weren’t? Perhaps, he said, a better idea might be to examine more closely the crises of recent decades and the long-term impact they might have made on his portfolio—such as the oil crisis of 1973, Japan’s bust in the early 1990s, the Asian currency crisis of the late ’90s, the tech wreck in 2000, and so on. Past performance is no guarantee of future results. Indices are unavailable for direct investment. Without wanting to downplay the real pain that these crises caused—in both financial and human terms—the advisor asked his client what, in retrospect, he could have done to spare himself their worst effects. Beyond, of course, diversifying his portfolio, rebalancing occasionally, and keeping his own long-term needs in mind. What if he had “waited out” the aftermath of the 1987 Black Monday crash? When would he have gotten back into the market? Was there an obvious re-entry point when Thailand, Indonesia, and South Korea came off their currency pegs in 1997-98? What expertise did he (or his advisor) have that would have gotten that timing right? Back to the present. While newspapers wrote thousands of words and TV stations aired hours of coverage about the latest debt ceiling showdown, many equity markets around the world have reached record or at least multi-year highs. This is not to assume smooth sailing in the future. But, as investors, we need to acknowledge that living with short-term uncertainty is the price we pay for the premium we receive by putting our long-term capital at risk. Crises will come and crises will go, as we have seen. Politics is, by definition, about the conflict between different ideas and values. Each of us can have an opinion about likely outcomes. But we can do ourselves a disservice if we base our investment decisions purely on forecasts about politics, economics, or anything else. Keeping your investment feet grounded in your own life circumstances and needs is preferable to dancing on somebody else’s ceiling.